When we are going on a holiday, we have to take care about our health to enjoy the holiday. Constipation can be the one of the health issue with which we can suffer. Here are some tips which help you to avoid constipation on your holiday. Alcohol and caffeine can cause dehydration which result in constipation. If you are traveling, try to limit alcohol and caffeine. Drink extra water which can make stools softer and easier to pass. Fluid can also help to prevent dehydration, which can cause constipation. Enjoy what’s on offer but order a side salad, or some fruits. Add more fiber to your diet to ease constipation on your holidays. Exercise is helpful for relieving constipation. Use your extra time to enjoy a jog, or walk, or yoga. 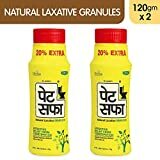 Take a natural laxative with you such as Pet Saffa which helps you along. Pet Saffa is completely herbal and help to ease constipation. If you liked reading this article – “5 Tips Which Helps You to avoid Constipation on Holidays”, do like it and share with others. You can share your views with us in the comment box below.